"I can be either truthful or liberal," says an impatient boyfriend dismissively fending off his girlfriend's appeal to reason along with her. The line's uncomfortable closeness to practicality is what Pink consistently fires its numerous bullets at. Pink questions the prevalent sexism in this country in its subtle and crude forms, the blatant prejudices our society is too stubborn to let go of, and the shameful hypocrisy that it conveniently employs as a shield against the uncomfortable questions it has been consistently avoiding. The film starts with showing a visibly shaken Meenal Arora (Taapsee Pannu) and her two equally terrified friends Falak Ali (Kriti Kulhari) and Andrea (Andrea Tariang) running away after a casual party unexpectedly goes terrifically wrong. The boys, whose feathers are ruffled, happen to be influential, cozily atrocious, wear entitlement on the sleeve and aren't limited by their seemingly non-existent consciences. The film doesn't show what actually happened until the end, but we learn through the developments that Rajveer Singh (Angad Bedi) is severely injured by Meenal in her attempt to resist his unwanted sexual advances, and is looking at losing an eye. Meenal refuses to apologise, and the boys put their despotism to good use and succeed in making the girls' life a hell. As the girls decide to fight back, they are helplessly made to wade through prison cells smelling of urine, patronizing police officers, mercilessly grilling prosecutors and the unadulterated misogyny rooted deeply in our culture that is still struggling to come to terms with globalization. Pink is born out of an infuriation to see how "consent", instead of being the sole criterion to judge an issue like this, is towered over by patriarchal-borne, conveniently lame perceptions of what the "hints" women give mean. It hammers home with all its strength, that a No means No. That No in itself is a sentence that needs no explanation. The movie takes sides, even before it begins, and doesn't make any pretence that it has still reserved its judgment about its characters. The boys are plain villains of pure black, deeply prejudiced and cockily entitled despite being well-educated and cultured. We don't see them with the slightest hint of remorse, before resorting to the vilest of acts (they molest Meenal, as a way of warning her) and they appear to be acting out of their own nature when they unveil themselves through each of their atrocities. Comparably more effort went into fleshing out the girls' characters. They are the mini-skirt wearing, tattooed, pierced "independent working women", which pretty much makes them more than qualified to be termed as promiscuous by our society. We see their incessant integrity, despite being emotionally susceptible to even moderate levels of manipulation. But this bias doesn't work against the film, as it is deftly employed to drive home the point the movie wanted to convey. Because the film's target is not these boys but the system that enables them to afford being remorselessly sexist and misogynist, it gets away with its key characters being caricatures. Bachchan plays Deepak Sehgal, a retired lawyer, whose personal tragedies keep him distracted and distorted but who is later shaken out of his bubble to take upon himself this crusade of defending the girls. He channels his rage into his concern and compassion for these girls, as his crumbling world makes him desperately need something that anchors him in sanity. Bachchan gracefully swings between subtle expression and theatrical delivery, and is cautious enough not to distract by overawing. 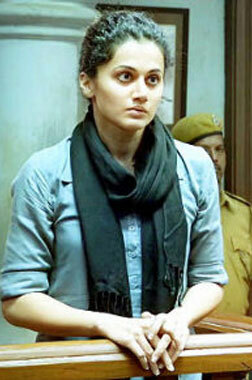 Taapsee, Kriti and Andrea bring terrific performances to the table. Piyush Mehra and the boys inspire your hate, and it proves their ability. The background score is more effective when it subtly underlines the proceedings rather than when it thinks it should instruct emotion to the audience. The cinematography and editing are in total harmony with the film's urgency and intensity. Pink is an important film that is perfectly timed. While we are still fighting sexism and misogyny in their blatantly obvious and direct forms, it shows we don't have time to wait to get to their subtler and sensitive variants. It employs gut-wrenching scenes to drive home its message, but it ably succeeds in delivering it. Hey GRRM, I took up work which keeps me occupied on most weekends. And reviews that come in after the weekend are like a stamp collection - might be of some interest to some but otherwise economically meaningless. Check out 'Parched' too, it touches upon the topics of patriarchy and misogyny. The line at the beginning of the review is uttered by a (grey haired, middle-aged) boyfriend and not by a father. Aside from that, nice review, Swaroop. Oops. My bad. I kind of remembered that happening between Meenal and her father. Must be another Hollywood ripoff. I loved it. Whether it's the feminism in the plot or the almost mythical heroism of Bachchan, both these key elements really worked for me. Aniruddha Roy isn't exactly Shoojit Sircar but hey, he can make up more than enough for his flaws. Hey Josh, are you not writing movie reviews anymore? I don't remember seeing your reviews in the past couple of months. I liked your reviews the most. Temporarily, yes. Might get back in a few months. fullhyd.com has 700,000+ monthly visits. Tell Hyderabad what you feel about Pink!